The undeclared war between Iran and Saudi Arabia has ratcheted up considerably with the bold abduction of high-ranking Iranian Diplomats and Revolutionary Guard commanders carried out during the recent Mina stampede. At least 1453 pilgrims were killed during Hajj on September 24, 2015 which some authorities claim was a highly coordinated black operation executed by Saudi authorities and MOSSAD agents in order to kidnap key Iranian attendees. These explosive charges include an elaborate conspiracy between Israel’s MOSSAD and the House of Saud to kill hundreds if Iranian pilgrims during the holiest day of the Islamic calendar. At last count 465 Iranians were killed on the same day observed as the “Stoning of the Devil” in the holy city of Mina just east of Mecca. Iran contends that losing the most pilgrims among all nations represented during this manmade tragedy was no accident. In light of these unprecedented allegations every other stampede which has taken place at major religious sites and on holy days ought to be be re-evaluated. 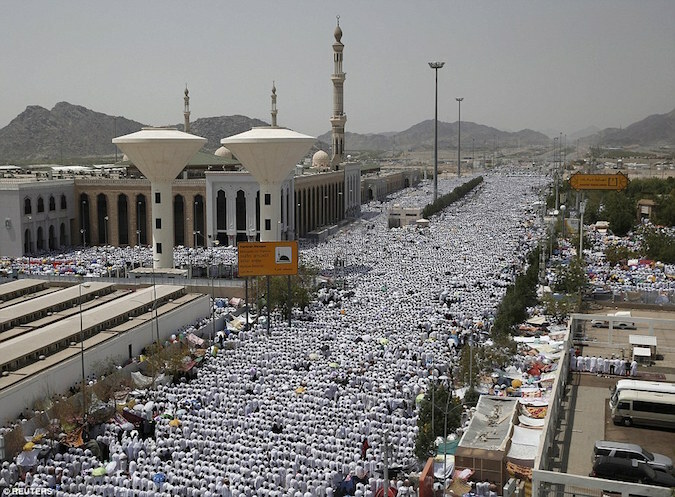 Because of the fierce rivalries that exist worldwide between different religions, as well as between various sects within the same religious traditions, this year’s Mina stampede has revealed the worst possible cause of such a terrible human tragedy. Are the deadly pilgrimage stampedes being incited by black op provocateurs? The following article is a substandard translation of the original report published by the Nahrain News Agency. Nevertheless, TMR felt it contained too many important disclosures not to post. Mossad has abducted a number of Iranian Revolutionary Guards Corps (IRGC) commanders, diplomats and prominent officials at last Thursday’s stampede near the holy city of Mecca. According to al-Nahrain-net News Agency, an unverified report of one of European intelligence agencies indicates that the Mossad, Israel’s foreign intelligence agency, has abducted a number of Iranian Revolutionary Guards Corps (IRGC) commanders , diplomats and prominent officials at last Thursday’s stampede near the holy city of Mecca. Al-Nahrain-net added that it also obtained information from European diplomatic sources in Brussels, suggesting that what deadly crush happened during the Stoning of the Devil ceremony (ramī aj-jamarāt) in Mecca was in fact a joint, pre-planned sabotage in order to kidnap a number of high-ranking IRGC commanders and Iranian diplomats. Al-Nahrain-net exposé on Mecca stampede which is based on preliminary intelligence reports indicate that Saudi and Israeli intelligence agencies have probably collaborated to abduct IRGC commanders, diplomats and staff working in Iran’s Supreme Leader’s office, Ayatollah Ali Khamenei. According to this report the former Iranian ambassador to Lebanon, Ghazanfar Roknabadi, is believed to have been kidnapped in the deadly stampede. Mr. Roknabadi is considered an eminent member of Supreme Leader’s office staff and a figure who is well-informed regarding the secrets of the Hizbullah missile armament by Tehran. Ali Asghar Fouladgar, the head of institute for IRGC strategic studies is also identified as missing. Hussein Danesh, Fo’ad Mashghali, Ammar Miransari, and Seyyed Hasan Hasani are all members of IRGC or Iran’s Supreme Leader’s office for pilgrimage who are declared missing. In a time that EU diplomats have altogether rejected the authenticity of this report, there is rising speculation that Russians leaked this information to western intelligence agencies. Al-Nahrain-net added that Iranian officials neither confirmed nor rejected the allegations regarding the abduction of Ghazanfar Roknabadi and other IRGC commanders during the hajj rituals. Israelis have always been very eager to discover the secrets of Iranian missile industry. While waiting for official confirmation, this report is considered just as a pending scenario, despite the fact that an unnamed European intelligence agency has released the information. If this report turned to be accurate, it will signify a high level of intelligence coordination between Riyadh and Tel Aviv for it seems almost impossible to carry out the abduction of the Iranian targets by Mossad or western agencies without the Saudi’s blessing and acquiescence.